Luxurious, sulfate and paraben free formulations to prevent colour-fade, leaving your hair healthy, glossy and radiant. Ultra-nourishing conditioners to extend the life of your colour and leave your hair moisturised and shiny. The Platinum Collection neutralises brassy, yellow tones and brightens your colour giving you the ultimate blonde, grey or white hair. Say goodbye to frizz forever and add intense moisture to thick and curly hair with our groundbreaking frizz-fighting formulations. Light enough to be used daily or weekly, our Intensive Masque ensures happy hair days, every day. The ultimate multitasker, Illuminoil™ can also be used as an overnight treatment to soothe dry, flaky scalps. Introducing Expert Colour Care, the most exciting development to boost the life and appearance of chemically and naturally coloured hair. A unique range of products formulated with innovative, luxury ingredients to protect and enhance your hair, keeping it lustrous and radiant. Expert Colour Care is completely sulfate and paraben free and designed so that every product in the collection locks in your colour with the help of Jo Hansford’s patented Anti-Fade Formula and bespoke Heliovita™ Colour Care Complex. It is the ultimate capsule collection of 12 award winning products, created entirely in the UK and tried and tested by a team of colour experts at the Jo Hansford Salon in Mayfair, London. Jo believes that the ritual of hair should be as pleasurable as a spa indulgence and has infused her signature grapefruit scent into all of the luxuriously textured products. Notes of refreshing grapefruit are blended with zesty clementine and citron in this elegant unisex aroma. This chic collection ensures that you leave the bathroom as you would Jo’s salon… with revitalised, healthy, glossy hair. As the leading authority in hair colour, Jo Hansford MBE has been showered with accolades throughout her career from being named the “first lady of colour” by Marie Claire and “best tinter on the planet” by American Vogue. Awarded an MBE for outstanding services to the hairdressing industry in 2010, HRH Duchess of Cornwall, Angelina Jolie and Elizabeth Hurley wouldn't trust their tresses to anyone else. With a unique approach, Jo was the first to bring colour from behind the scenes to the front of the salon, and was instrumental in raising the profile of hair colouring throughout the industry. Jo opened her Mayfair Salon in 1993, and in a more recent endeavor, personally created a technically brilliant Expert Colour Care Collection for maintaining radiant locks at home. Keen to create a 100% British brand, Expert Colour Care is produced entirely in the UK, free from sulfates and parabens and is the sole independent hair care brand whereby every product is specifically developed to care for your colour, whether chemically treated or natural. It will clarify and remove any brassy tones from blonde or highlighted hair leaving you with healthy, glossy locks and the best blonde ever! 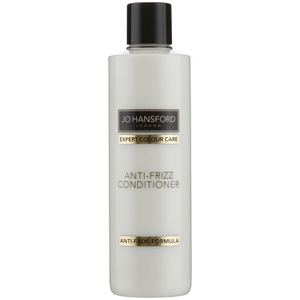 Use as a weekly treatment in between your preferred Jo Hansford Shampoo and Conditioner. Pump up the volume with the Volumising Shampoo and Conditioner duo. Unrivalled root-boosting technology encourages growth and guarantees long-lasting body and shine, whilst protecting and enhancing your hair colour. For healthy, glossy, nourished hair this winter, multi-tasking Illuminoil is a must. A blend of 5 luxurious oils are combined and infused with Jo’s signature grapefruit scent to create this super-lightweight oil that your locks will love! 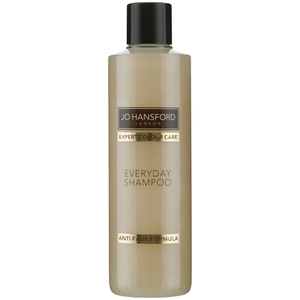 With the emphasis on healthy hair, Jo Hansford MBE developed Expert Colour Care, a range of luxury products, aimed at restoring colour treated hair to its lustrous origins with the perfect blend of ingredients, all of which are sulfate and paraben free. With a unique, patented Heliovita™ Care Complex and a whole host of nourishing vitamins aimed to protect and prevent colour fade, the Jo Hansford range of Masques, Shampoos, Conditioners and Oils will volumise, shine and de-frizz depending on your hairs needs. Blessed with natural, non-coloured hair? Don’t fret the range is designed to maximise your hairs potential with all of its fantastic natural ingredients along with UV filters to keep your hair super healthy and safely sun kissed.